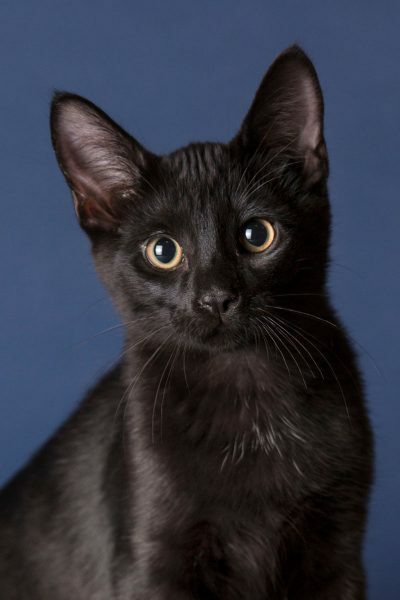 Selwyn is an all black male, among the litter of four “Welsh” kittens. He does have a thin crescent of white hairs on his belly, which are his unique pattern. 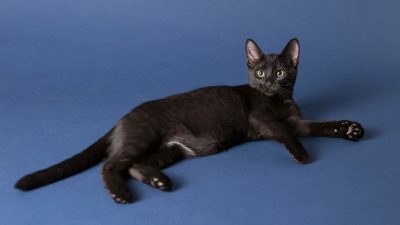 Selwyn is one of the shyer kittens, and takes a while to become accustomed to new people and places, but once he gets to know you, he is very affectionate, and rewards you with loud purrs. A real gentleman, he often plays by himself, and is the most reserved of his litter mates. He is accustomed to being with others, and would do well if adopted with his brother Griffith, or even other cats. He would do well in any situation where he can take his time getting to know you. 2017-12-12: Lucky Selwyn, the last of the four Welsh Kittens, found his forever home just in time for Christmas!